James Bond hasn’t left the baccarat table. But he’s got company. The dragon and the panda are in the room, too, along with the Las Vegas-based brand that’s brought them to life. That comes courtesy of co-creators Francisco “TJ” Tejeda and Robin Powell, both principals of Talisman Group. Their version of the game, EZ Baccarat, has approximately 700-plus tables in the use from San Diego to Nova Scotia to Macau. Over the last five years, spokeswoman Michelle Laird said, the game has grown 315 percent. Hence, EZ Baccarat’s dragons and pandas, familiar symbols in Asian culture. The game also solves a problem. Without changing other aspects of baccarat, it eliminates the dealer’s duty of extracting the casino’s 5 percent commission. Powell and Tejeda met in 1993 while opening MGM Grand’s baccarat room. For both, casinos have been a way of life. Tejeda recalled starting his career at Harrah’s in Reno in 1971 and meeting Bill Harrah. Tejeda moved from dealing, to supervising, into the international marketing of baccarat, first in Latin America and then around the world. Powell’s résumé includes a stint as a craps dealer in Botswana. At 19, he began dealing chemin de fer, Bond’s game of choice and the forerunner of baccarat, in Swaziland. Powell made his way in casino operations, bouncing from Australia to Africa to Monte Carlo to Spain. At MGM Grand, both witnessed the action of the baccarat room. They believed the Las Vegas custom of forgiving the commission when a large bettor loses and runs out of money had a serious downside. Add that to a melee of arguments over commission and dealer errors that sully the social atmosphere and irritate customers. Slowing the game also means fewer hands — and less money for casinos. One hundred-fifty pages of data later, Tejeda and Powell settled on the solution. When the banker wins with three cards totaling seven, the win becomes a “push” instead, and the casino automatically makes its money. EZ Baccarat’s use of the “push” rule results in the equivalent of taking 4.912 percent commission out of every winning banker bet payout. The winning banker hand that makes it possible occurs about twice per eight-deck shoe. Except for that hand, winning banker bets are paid even money — 1-to-1, instead of the 19-to-20 of classic baccarat. And, the house edge on a banker bet in the EZ version is 1.018 percent. But Powell went one better, creating the Dragon 7 as a diversion or side bet that pays 40-to-1 when the banker wins with the otherwise undesirable three-card seven. That transformed a “downer” into a “celebration,” he said. Tejeda followed up by creating the Panda 8, which launched in 2011 as a player’s side bet. It wins with three cards totaling eight (an auspicious number in Asian numerology). It pays 25-to-1. The Panda also fortified EZ Baccarat’s brand in the face of imminent patent protection loss in 2013. 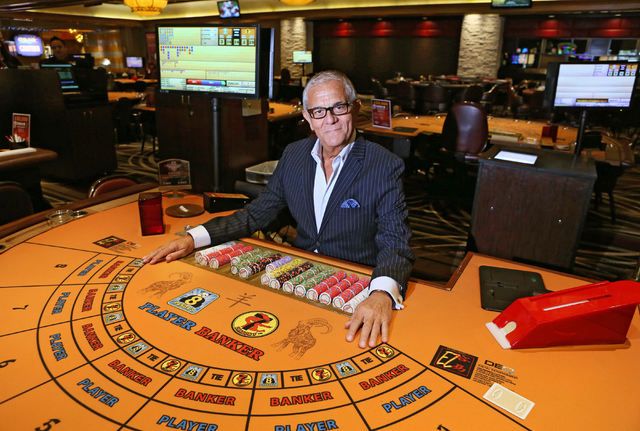 EZ Baccarat has dodged the downswing of revenues among Strip powerhouses, Tejeda said, appealing instead to more traditional customers at places such as Station Casinos properties. Palace Station Casino Operations Director Scott Morrow said that 10 of the casino’s 13 baccarat games are EZ Baccarat. And, LT Game, a major gaming and casino provider in Macau and in the Asia Pacific region, will put EZ Baccarat on its terminals worldwide by year’s end, Powell said, and will distribute the table game throughout Asia. Meanwhile, GameAccount Network, a United Kingdom-based gaming software company listed on the London and Dublin stock exchanges, may expand EZ Baccarat to 10 virtual gaming sites by year’s end. Achieving this success hasn’t been easy. It took 10 years to sell the first two tables Now Tejeda has a message for the competition. “LT would never have come to us if we hadn’t been tested in the field of marketing battle,” he said.